Improving your car’s audio system is the ideal way to improve its value. It’s also the best way of enjoying it in a new way. This is especially true for music lovers. You may even feel as if you’re driving a brand new car. However, you need to install high performance car speakers, otherwise you’ll only get distortion if you increase the volume.5x7 speakers are an excellent option to use in your car, because this size fits most vehicles. In this review, I have compiled a list of 5x7 speakers that are on my list of quality sound products. 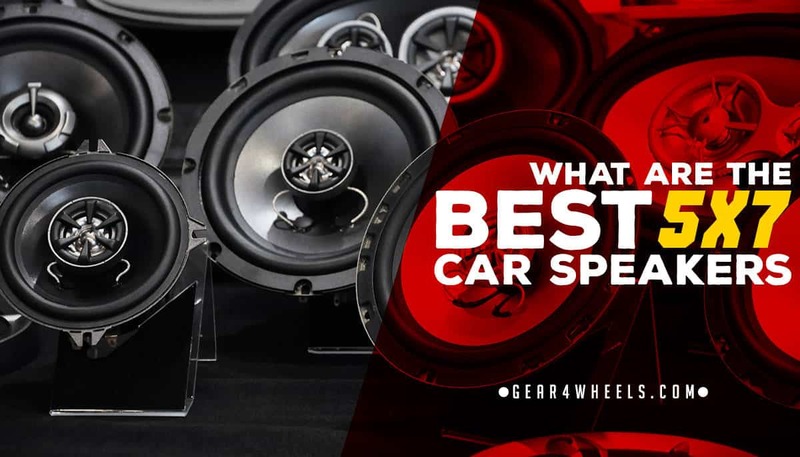 You can browse through these five well-designed speakers to find the one that will most enhance your vehicle’s sound, while also fitting your personal style and the car’s look. Most of these items will offer clear and loud sound when connected to your amplifier and sound system. Even without an amplifier, you’ll still feel the difference when you compare it to factory produced sound. When you’re purchasing sound equipment, it’s vital that you look at specifications, but also keep durability in mind. This is determined by the type of casing, the way it was manufactured, and the material used. Will your chosen speaker afford you excellent sound for a long time to come? Which ones are you going to purchase? The first speaker on my list is a winner in many aspects. You probably know JL Audio engineers are experts at producing excellent products. These speakers are even better than those in the C2 series, which were already impressive. Firstly, the designers made sure the speakers’ casing assists in durability as well as sound quality. The butyl rubber surround protects the contents against the effects of vibrations. The elevated frame enables the speakers to cool efficiently, so no overheating occurs. The frame is cast from an alloy and this manufacturing method makes the frame a solid foundation for the rest of the components; cast items have smaller chances of producing cracks. Secondly, the quality of the produced sound is enhanced thanks to a silk dome tweeter. This silk tweeter is excellent for high frequencies, assisted by a high and low pass crossover. Mid and low sounds are also terrific coming from these speakers, so all types of music can be equally enjoyed, thanks to the woofer cones that are manufactured from mineral-filled polypropylene cones with butyl rubber surrounds. As mentioned, quality gear is vital if you want exceptional sound. Even the barrier strips in the crossover are protected by nickel. JL Audio opted to leave out the speaker wire and in its place, you receive spade connectors and quick slides. These can be crimped onto your existing speaker wires, which makes for a much better connection. All of these features help to bring you some of the best sounds you’ll enjoy in your car. Focal speakers are great for those looking for superior sound quality. These speakers have the typical speaker look, which is perfect if you prefer classic styles to modern ones. If your speakers are in full view of anyone using your car, you should choose a product which is aesthetically pleasing, apart from it giving auditory joy. Focal offers you an all-round well-designed product. The fiberglass woofer cones produce amazing low tones and the aluminum tweeters supply smooth high frequencies. All of this is housed in a steel chassis, which keeps the various components safe. A durable structure is essential, since all car sound systems experience some shock during traveling, or simply when the sound system is in use. The oval shape of these speakers is problematic to some car owners. However, this opinion is based on the space—and shape of the area—available to install speakers. If you need to replace existing speakers that are the standard round shape, you may need assistance to create appropriate holes for these units. Polk Audio offers you a variety of full-range systems, components and subwoofers. They succeed in creating units that rank high in aesthetics, functionality and durability. They even make sure their items can be used in many vehicle types apart from cars, such as boats. How did they get this right? Polk Audio harnesses the power and characteristics of both natural resources and modern technology. Durability and strength of the units are ensured by carbon composite baskets. This means your speaker can endure the strain and shock that general travelling creates. This all speaks of state-of-the-art technology and it generates clear sound of all frequencies. These speakers really offer a greater frequency range than most competitors. Polk Audio understands the requirements vehicle owners have when they’re shopping for new speakers. You need powerful speakers, but heavy ones will weigh your car—or boat—down. Thanks to neodymium magnets that weigh very little, these speakers don’t add much weight when installed. They only weigh 4.4 lbs. and their 3” thickness means they can easily be installed in most vehicles, no matter the space available. JL Audio has an excellent reputation for a reason, and his is another product in the JL Audio range that showcases designing and engineering victories. Firstly, you’ll love that high frequencies can be handled by the tweeters installed, without giving too much distortion. This effect is partly due to the woven textiles used in the design. These dampen excessive noise much better than similar plastic versions. Even if you play loud, high frequencies, your ears won’t grow tired, because very little noise will accompany the high-pitched sounds. Unfortunately, the exceptional high and mid sounds aren’t accompanied by the same quality bass sounds. If you’re looking for impressive low sounds that you can feel and hear, you may need to invest in separate woofers, or consider other 5x7’s. These Rockford Fosgate speakers are part of a wide range of speakers on the company’s product list. It’s amazing when a brand offers you a variety of sizes, so you can exactly choose what you need. This specific size is a coaxial speaker with a built-in ICC (Integrated Concealed Crossover). You’ll love the quality and balance of sound you receive. In terms of quality, Rockford Fosgate makes sure the speaker will last a long time, thanks to a mineral-filled and polypropylene injection molded cone. This affords strength, and the unit is protected against shock via the butyl rubber in the surround. They physical design of the speaker must be taken into account, because the ovals may not fit into every car’s existing speaker cubicles. This calls for customization, which not every car owner wants to consider. Rockford Fosgate does provide an adaptor plate, but I don’t advise you to assume that this will work. Testing its dimensions before you purchase this set may be a wise idea. Once again, JL Audio comes out top in my books. The C5-570X speakers are simply everything I was looking for when shopping for my car. When I’m driving, I now enjoy clear and powerful sound. I can even push the volume without fearing that the speakers will pop. Give them a try so your driving time can become more fun.